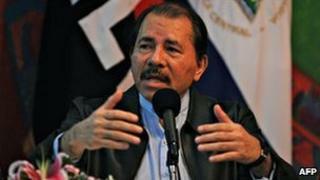 The government of Nicaragua's President Daniel Ortega was financed by the proceeds of the drugs trade, according to Wikileaks' US diplomatic cables. Mr Ortega and his Sandinista party allegedly received campaign contributions from the trade in return for freeing jailed drug traffickers. Another cable says Nicaraguan officials returned from visits to Venezuela with suitcases full of money. Those may have helped to influence the outcome of 2008 polls, it said. According to one of the released cables which appeared on the website of Spain's El Pais newspaper on Monday: "Daniel Ortega and the Sandinistas have regularly received money to finance [his party] FSLN electoral campaigns from international drug traffickers, usually in return for ordering Sandinista judges to allow traffickers caught by the police and military to go free." Furthermore, it says: "In 1984, Daniel Ortega negotiated a deal with Colombian drug kingpin Pablo Escobar whereby Escobar received refuge for several months in Nicaragua after he had ordered the killing of the Colombian minister of justice." In return, Mr Ortega and his party, the FSLN, received large cash payments from Pablo Escobar, it adds. On the subject of the elections, one cable says: "We have first-hand reports that [Nicaraguan] officials receive suitcases full of cash from Venezuelan officials during official trips to Caracas," the US embassy in Managua said in a 2008 cable. "Multiple contacts have told us that Daniel Ortega uses Venezuelan oil cash to fund the [ruling party's] municipal election campaigns. Several unconfirmed reports indicate that Ortega will have as much as $500m at his disposal over the course of 2008," it added. The cables were written months before the municipal elections held in November 2008, in which the Sandinistas won big victories, and later faced widespread fraud allegations over the polls. The Nicaraguan and Venezuelan governments were not immediately available for comment, says Reuters news agency. Left-wing leader Daniel Ortega and his Sandinista rebels fought US-backed government forces in a 1980s civil war before being voted out in 1990. He made his political comeback in the November 2006 elections, taking office again in January 2007.